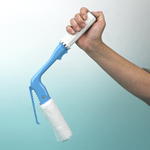 The 24 inch Long Handled Cleaning Sponge is useful for personal bathing or everyday household chores. The length of this washing sponge makes it easier to reach hard to clean areas. The handle on this 24 inch sponge is made of acrylic. For caregivers, this washing sponge is a great way to ensure proper hygiene and patient comfort. The sponge which is mounted on an angle was designed to relieve the need to over extend yourself. Whether using for personal care or everyday household tasks, The Long Handled Cleaning Sponge will provide an easier and more comfortable way to wash.